Zilina station is not the most inspiring place to start a journey and my spirits weren't lifted when train R603, the Chingov express arrived from Bratislava. Filthy carriage windows and a scruffy restaurant car didn't bode well. However first class in Slovakia is both comfortable and affordable and I took a seat with an unrestricted view. Research showed that the best side to sit was on the left hand side facing the direction of travel and this proved to be the right decision. The 242 km journey has scenic interest for most of the way with an ever changing view from the window. Don't expect high speeds as the train traverses an often steeply graded and tightly curved route with numerous bridges and viaducts with some tunnels. Just relax and enjoy the view. Leaving Zilina the train heads out past extensive marshalling yards before the scenery starts. As in many mountainous areas the railway follows river valleys taking the easiest route to gain height. First stop is Vrutky with extensive workshops building and maintaining Slovakian Railways passenger rolling stock. Timekeeping was good and short station stops meant the train stayed on schedule throughout the journey. With improving scenery the train reaches Krafovany from where it continues to Ruzemberok. The mountains have closed in by now as the train threads uphill. After Ruzemberok the landscape opens out and you get you first view of the Tatras on the left. In order to gain height more easily the railway follows two long looping curves with reservoirs also on your left. Looking back you can appreciate the height gained on this section. 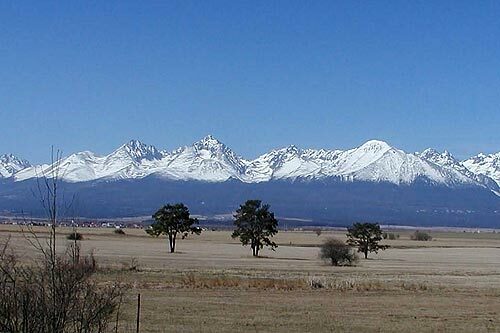 Liptovsky Mikulas is the next stop and leaving the station you start to get some wonderful views of the Tatras. Strba is the next halt and you can change here for the rack railway opened in 1896 that ascends high into the Tatras at Strbske Pleso where it connects to the metre gauge Tatra Electric Railway. Continuing you should get a good view of the highest peak in these mountains - Gerlach which rises to 2655 metres (8710 ft.). Next stop on the timetable is Poprad Tatry and by this time you have started the descent towards Kosice. This station is the mainline terminus of the Tatra Electric Railway which leads back to Strbske Pleso. For railway enthusiasts the approach to the next stop at Spisska Nova Ves provides a good view of the extensive locomotive depot on the right hand side. The scenery is perhaps not so good now but there is still plenty to interest the traveller. One point worth noting is the severe poverty that still exists in this part of Slovakia with a few examples mainly on the right side of the train with almost derelict single story houses still inhabited. A stop at Margecany is followed by another at Kysak before Kosice is reached with much evidence of its industrial character. The station is as uninspiring at Zilina and its worth noting that a large slice of the station facilities have been converted to an Aldi supermarket. At least it is brightly lit in contrast the rest of the station! The historic and attractive centre of Kosice is a short walk reached by heading out of the station and following a wide pedestrian route across a park. The main street is found by continuing straight on into the shopping area. The many fine buildings in the city make a fine end to a great rail journey.